1980s American Art Pottery Fisherman's Hat Planter. 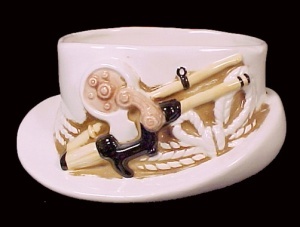 White Porcelain China, shaped like a Fishing Hat, embossed with Rod & Reel, plus Nautical Rope, Hand Painted and under glaze. Marked with Red and Gold Lefton Tag & Clear Plastic Lefton Tag with Crown. Imprinted on Bottom: 1984 George Lefton, #01332. Gently Used. No chips, cracks, scratches. Small amount of crazing on underside. Light soil inside.